CONSTRUCTION: Drain consists of a cast aluminum dome strainer, a cast aluminum epoxy coated gravel guard/clamping ring, 15" O.D. spun Aluminum drain flange. The outlet pipe has a rubber seal. Optional is #66101 with expanding foam/tape seal. APPLICATIONS: ReRoof Drains- for quick and easy retrofit of existing roof drains. ReRoof Drains are the easiest and most reliable solution for deficient existing roof drains in re-roofing applications. Portals Plus ReRoof Drains are designed to sleeve into the existing drain pipe below the existing roof drain, thereby bypassing all the inherent deficiencies of the existing roof drain assembly and saving the expensive removal of the existing roof drain. To create a positive seal with the inside of the existing drain pipe, the ReRoof Drains has a epdm rubber seal. The ReRoof Drains are manufactured with a flat horizontal flange for flush mounting on the roofing or insulation surface to prevent damming of water. Each ReRoof Drain includes a heavy cast clamping ring with four bolts to securely compress and permanently seal the edge of the new roof membrane at its most vulnerable position- the low point of the roof. 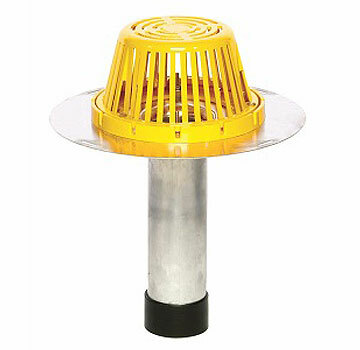 Dome strainers bolt down to securely prevent vandalism. Portals Plus ReRoof Drains are completely installed from the rooftop with no special tools and require only one- 7/16" wrench to secure the clamping rings and domes.